After so many hears of healthy eating being forced down the pudgy gullet of the American diner, the health backlash has started in earnest. The KFC Double Down was only the beginning, as Massachusetts-based restaurant chain Friendly’s has taken the hamburger to the extreme, thanks to an unholy union with the grilled cheese. 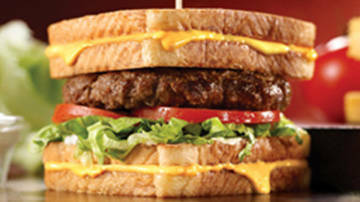 The resulting beast is a 1,500-calorie hamburger dubbed the Grilled Cheese Burger Melt (or BurgerMelt), which features a giant hamburger sandwiched between two grilled cheese sandwiches. Excuse me while I shudder violently and heave for a moment. When it comes to novelty food, there’s the unhealthy food that’s a deliberate oddity, like the enormous novelty hamburger, and then there’s the deliciously unhealthy food item that’s a menu staple. This is a menu staple. This is the kind of sandwich that gets people sued for contributing to America’s general unhealthiness. The average person only needs 2000 to 2500 calories; so you can have one burger and three bowls of 150-calorie oatmeal, or one burger and a smallish side of fries.